Nila Holden only began her business three years ago whilst designing cookies and cakes for her own wedding, since then she has gone on to sell her wonderful creations on Etsy, Notonthehighstreet.com and now she even supplies Fortnum & Mason. Her designs have gradually become more and more influenced by her love of all things vintage, literary and bohemian. Perfect for Betty! For Christmas why not try these super cute stained glass window biscuits? You can hang them anywhere and even use them as place settings for your festive table. Sift the flour and baking powder into a mixing bowl and add the caster sugar. Grate the cold butter into the mixing bowl. The colder your butter, the easier this will be. Or if easier, you could cut the butter into small cubes and add to the bowl. Crack the egg into a separate bowl to ensure you don’t get any rogue shell and beat. Add the golden syrup and vanilla essence to beaten egg and mix. Make a well in the dry ingredients bowl and pour in the beaten egg, golden syrup & vanilla essence mixture. Mix together to form a dough. Try not to overwork the dough as this will make it tough. 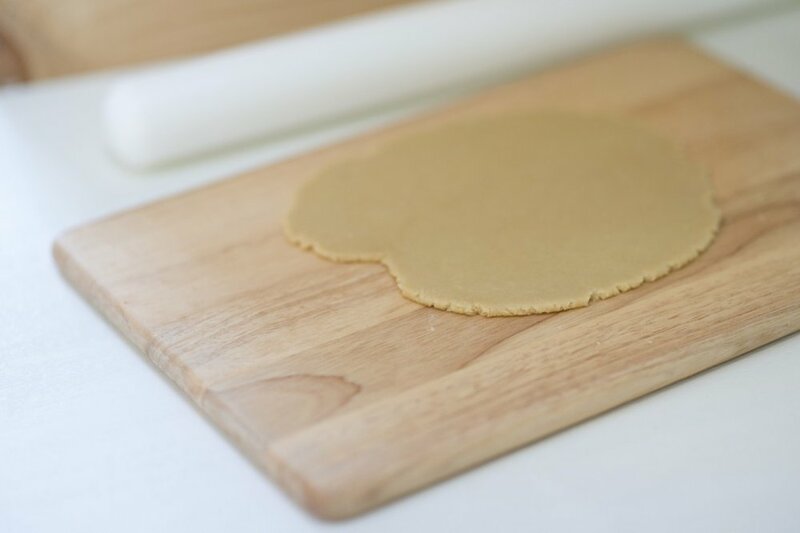 Place dough into a plastic food bag and flatten to form a disc shape. Refrigerate for 30 mins to chill the dough. In the meantime place the boiled sweets in a food bag and crush with a rolling pin until you have a fine powder. After 5 mins take the cookies out of the oven and leaving them on the tray, sprinkle the crushed boiled sweets into the centre of the cookies. You will need to work quickly here, but take care not to get any powder onto the cookies at this will not look great when completely baked. Also make sure that the space is inside the cookie is covered to the edges with the crushed sweet powder. Return the tray to the oven and bake for a further 5 mins. The stained glass house cookie (as seen in the header) is made in exactly the same way, just using a house cutter, and by cutting out four mini squares in the middle. Nila has used green and red sweets in opposite squares and highlighted the eaves with some white sugarpaste. Be as creative as you like! Discover more about Nila and sign up for her baking tips and tricks via e-mail on her website here. Hang these delicate stained glass biscuits anywhere and even use them as place settings for your festive table. Meanwhile, line two baking sheets with baking parchment. Remove dough from fridge and roll out on a lightly floured surface until about 5mm thick. Using round cutters cut out your circles and place on the lined baking tray. Using the mini cutters, cut out a shape from the centre of the circle taking care not to distort the circle. Take the pointed end of a clean paintbrush or lollipop stick and make a hole at the top of the cookie. Place in the oven and bake for 5 mins. When baked, remove from oven. You may need to repierce the wholes at the top of the cookies if they have closed up a bit. Carefully remove from the tray and cool on a wire rack. When completely cooled, thread some bakers twine through the hole at the top of the cookie and tie a knot at one end. And voila – you have some beautiful stained glass decorations for your tree! A good way to disguise any drops of melted sweets that might have crept onto your cookie shape is to roll out a small amount of sugar paste and then cut out a circle with the same cutter you used for your cookies. Cut out a shape from inside the circle with the matching cutter. Using a paint brush lightly cover the cookie with edible glueand cover with the sugarpaste. Once you’ve mastered the technique, why not try experimenting a little, with different cookie shapes or different coloured sweets?